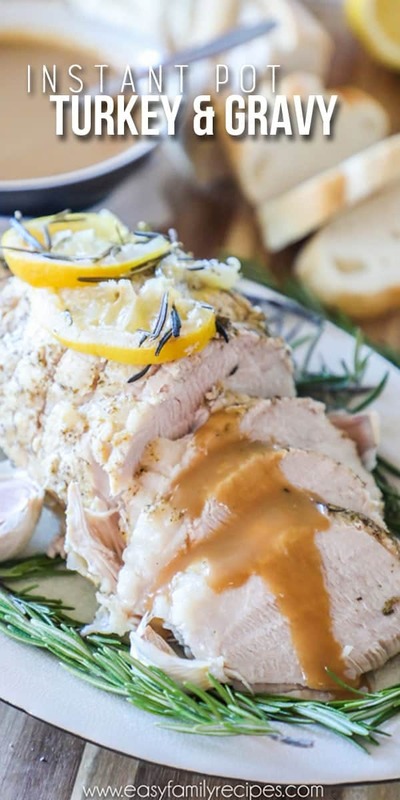 Turkey breast in the pressure cooker is one of the most flavorful and tender ways to prepare it! Not only is it delicious but it is surprisingly easy to make. With just a few ingredients, you can take the turkey breast from completely frozen to perfectly cooked in as little as an hour! By using the natural drippings that cooking creates, you have have gravy to go with the turkey all in one pot just in minutes also. I am going to let you in on a little secret that I didn’t know until just a bit ago… Turkey breast doesn’t have to be dry! This took a little thought, and about 3 turkey roasts, to come up with the right combo of ingredients and cook time for the perfect turkey, once we got it right, it was SO RIGHT! I never knew turkey breast could be so moist and delicious! Can you use frozen meat in the pressure cooker? YES! This is actually the best part! 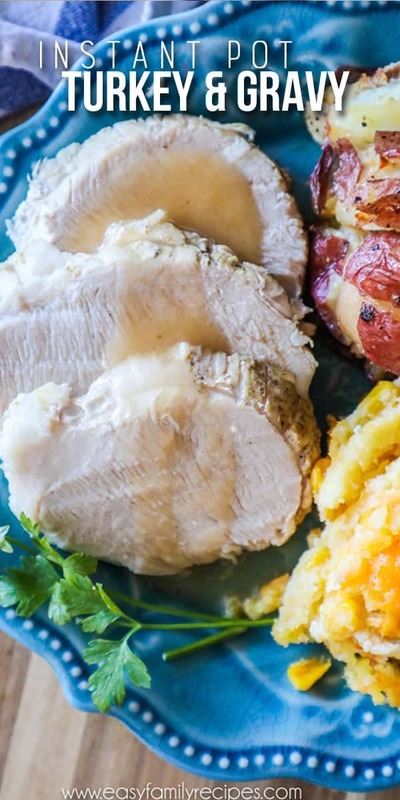 You can literally take the turkey breast out of the freezer frozen solid and pretty much put it straight into the pressure cooker, no thawing required! The only extra step I take, detailed below, is that I cut off the plastic and run the turkey under warm water until I could remove the gravy packet off of the turkey breast. The recipe I have detailed here cooks the turkey breast from frozen. If your meat is not frozen, you will need to reduce the cook time. Once the meat has finished cooking, it can be served right away or anytime while it is still warm. I use tongs to remove the turkey breast from inside the pressure cooker and place it on a platter. Be careful! It will be very hot! The lemon and rosemary that were on top while cooking can be discarded, or set to the side to reuse for garnish, as in the pictures. Then the pressure cooker turkey breast can be carved into slices at a thickness of your preference. My slices are about 1/2 inch thick. I like to lay the slices out a bit so it makes a really nice presentation. You can spoon the gravy right over it or leave it to the side for each person to add on to their plate. For presentation, I used a medium sized platter and placed the turkey breast on it and added additional fresh rosemary and garlic around the sides. The lemon and rosemary that cooked on top of the turkey were replaced for garnish. They get pretty delicate after cooking so if yours don’t work, you can still cut fresh lemon and rosemary and use that for the top. I also cut some slices to get started with the turkey and fanned it out a bit. You can use your imagination to recreate this or add as much as you want for your presentation. This turkey will be stand on its own, but I do have some really delicious sides that make a great compliment to the meal. Try serving it with this creamy and oh-so-delicious Jiffy Corn Casserole and these ranch smashed potatoes which are my favorite way to make potatoes. Add some cranberry sauce and a green veggie and you have a meal for the books! This is perfect for Thanksgiving or Christmas but easy enough for anytime in between. 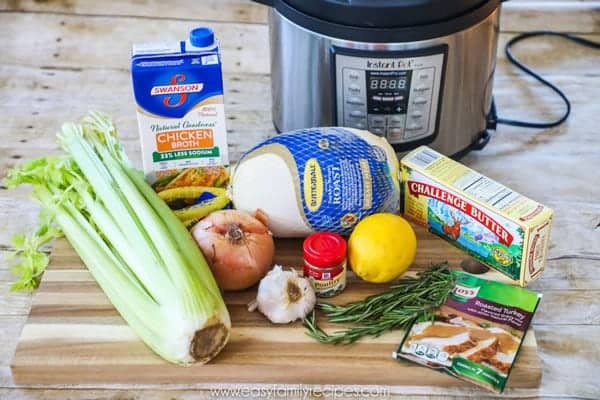 I am going to walk through making this recipe for pressure cooker turkey breast with you step by step here. If you are new to your pressure cooker or an old pro, this recipe should be very simple and straightforward so that you can get a great result. I use an Instant Pot to make this, but you should be able to achieve the same result with any electric pressure cooker. 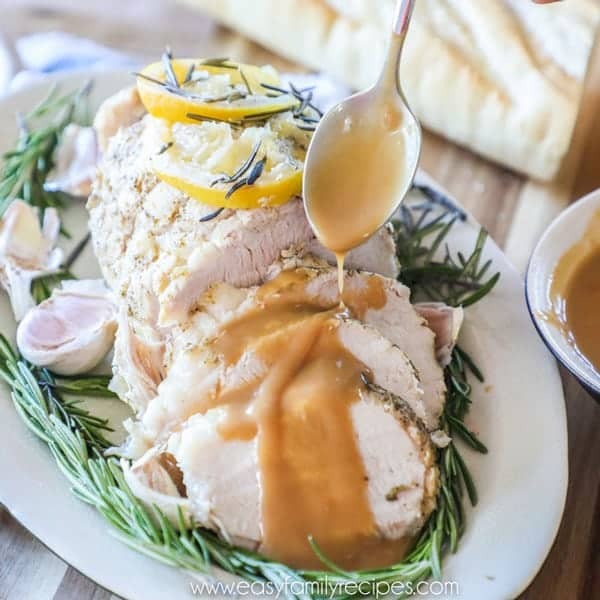 If you are looking for the quick version of the pressure cooker turkey breast recipe, feel free to scroll to the bottom of the post to find the recipe card. 1 Butterball Turkey Breast Roast- This is the 3 pound turkey breast that you will find in the freezer section. At my store it is near the traditional full turkeys. 1 tbsp poultry seasoning- I use the premade seasoning from McCormick, but you can make your own poultry seasoning mix if you prefer. 2 tbsp butter, cut into pats- Just cut it up into 3-4 slices and that will do. 2 lemon slices (optional)- You can omit these if you want but I love the flavor of lemon on turkey. If you do use lemon, only place a couple of thin slices on top of the turkey breast. Don’t put any extra in the broth or it will make the gravy bitter. 1 sprig rosemary- Again optional, but adds to the flavor. I think fresh rosemary is just a wonderful flavor for Thanksgiving especially! 1 onion, quartered- Any type will do here. You can roughly quarter it. This adds flavor to the broth and will be removed so the size/shape doesn’t matter much. 3 stalks chopped celery- Again for flavor so leaving it in bigger chunks is better so that it is easier to strain out. 4 garlic cloves- This is also for flavor so you can remove the skin and leave them whole in the broth. 2 cups chicken broth- You can use store bought broth or learn how to make homemade chicken broth super easily here! 2 McCormick Turkey Gravy packets- I use the Turkey Gravy packets but any flavor would work, or you can make gravy from scratch if you prefer. Remove the packaging from the turkey. This is usually an outer plastic netting and the plastic wrapper around the turkey. I use scissors to easily cut them away. Next, run it under warm water until you can separate and remove the gravy packet from the turkey breast. This may take a few minutes so you can leave it in a bowl of water for 5 minutes or so if you prefer. Now all that is left should be an inner netting on the turkey breast which will help it keep it’s shape. You can leave it on while cooking. Rub the outside of the chicken with the poultry seasoning as evenly as you can and set it aside. 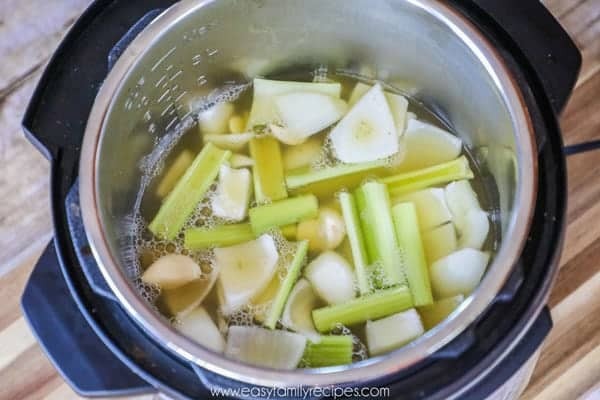 Place the celery, onion, garlic cloves, and chicken broth in the bottom of the pressure cooker pot. As I mentioned above, these are to create a great flavor so they can be in larger chunks. They will be strained out after cooking so it makes it easier. Place the trivet in over the vegetables and broth and set the frozen turkey breast roast on top of it. Place the butter pats, lemon slices and rosemary on top of the turkey breast. I usually do it in that order. Close the lid to the pressure cooker and set the valve to sealing. Then use poultry mode and adjust the time to 55 minutes and let cook. When cooking is done, natural release for an additional 20 minutes. If you are new to the Instant Pot, all this means is that once the cooking timer sounds signaling that it has finished, the Instant Pot will then begin to count up. Let it count up until it gets to 20 minutes which will effectively slowly and naturally release the built up pressure, rather than hitting the valve to quick release it. Last, open the lid and check the temperature which should be 170˚F throughout.IMPORTANT NOTE: I have made this many times in the Instant Pot cooking it for 50 minutes with it turning out perfectly. I am located at sea level. If you are in a higher altitude, you may need to raise the cook time about 5-10 minutes so that it cooks completely. Remove the roast and strain the vegetables, reserving the broth and pour it back into the pressure cooker pot and add both gravy mixes. To do this, I use a mesh strainer and pour the pot through it into a bowl then return the strained broth into the pot. You can discard the vegetables, and either throw away the lemon and rosemary or save it for garnish. Turn the pot on to the sauté setting and whisk continuously until it comes to a boil and then about 3-5 additional minutes until it thickens. Turn the pressure cooker off and remove the gravy from the heat. The gravy will continue to thicken as it cools as well. Cut off the netting from the pressure cooker turkey breast and place on a platter to carve. Serve warm with as little or as much gravy as you want! Enjoy! I really hope this meal is loved by your family as much as it is by ours. We have loved this so much that we have been adding it into our dinner rotation outside of the holidays too. You can’t beat the combination of how easy and delicious it is! If you get a chance to make it, I would love it if you left me a comment below! I love to hear when others are making and enjoying the recipes we share. 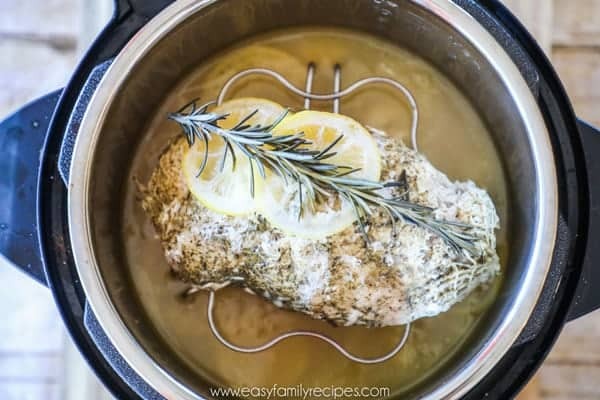 Or if you snap a pic of your pressure cooker turkey breast and post it on Instagram make sure and tag me so I can see your creations @easyfamilyrecipes. 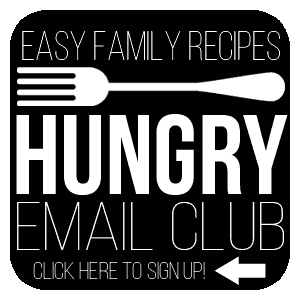 Before you go… If you haven’t yet, make sure and take a minute to sign up to get my e-mails where I share quick and easy dinner inspiration and the best of my quick and easy recipes. You can sign up here or by clicking on the icon below. 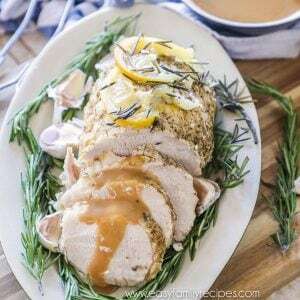 Making turkey breast in the pressure cooker is the easiest and best way to prepare it! It comes out tender, moist, and so flavorful every time! The best part is that you cook it from frozen so you can make it without having to remember to thaw it several days ahead of time. Remove the packaging from the turkey then run it under warm water until you can separate and remove the gravy packet from the turkey breast. You can leave the inner netting on while cooking. Rub the outside of the chicken with the poultry seasoning and set aside. Place the celery, onion, garlic cloves, and chicken broth in the bottom of the pressure cooker pot. Place the trivet in and set the turkey breast roast on top of it. Place the butter pats, lemon slices and rosemary on top of the turkey breast. Close the lid to the pressure cooker and set the valve to sealing. Then use poultry mode and adjust the time to 55 minutes and let cook (see note section for altitude adjustments.) When cooking is done, natural release for an additional 20 minutes. Then open the lid and check the temperature which should be 170˚F throughout. Remove the roast and strain the vegetables, reserving the broth and pour it back into the pressure cooker pot and add both gravy mixes. Turn the pot on to sauté and whisk continuously until it comes to a boil and then about 3-5 additional minutes until it thickens. Turn the pressure cooker off and remove the gravy from the heat. Cut off the netting and serve warm with as little or as much gravy as you want! Enjoy! IMPORTANT NOTE: I have made this many times cooking it for 45 minutes with it turning out perfectly. I am located at sea level. If you are in a higher altitude, you may need to raise the cook time about 5-10 minutes. To prepare this recipe as written the turkey must be frozen. If the turkey is thawed you can use the same method with a reduced cook time. This recipe was created using an Instant Pot electric pressure cooker. Modifications may need to be made for other types of pressure cookers. My turkey breast is not frozen. 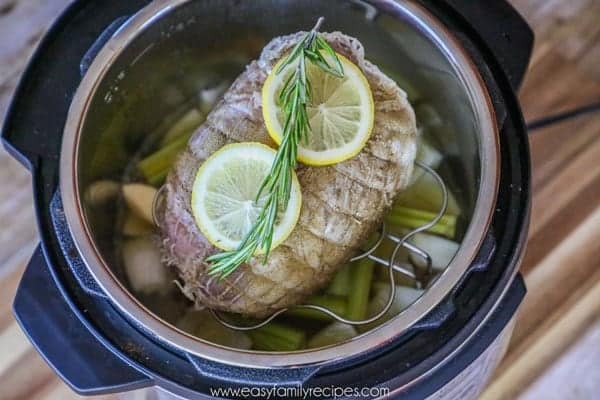 How long should it cook for in instant pot? It’s the butterball turkey breast. We also have a larger breast (8.6 lb), but I see no replies to the question. Really would like some suggestion. I have a 7# roast, am wondering the same thing. Mine is not boneless as the one on the recipe appears to be. How much time would you recommend for a 5lb roast? I made this last night – I left off the butter, rosemary and lemon slices. Everything about the recipe was awesome, so easy and it tastes really good! I did use a defrosted turkey breast (3lbs) and did Manual 25 min (I took it out of the netting) and it came out really good. We shredded our turkey and mixed it directly into the gravy and plan on making open face turkey sandwiches – Thank you! Chef Rambo? You put a frozen turkey breast in and expect it to be done in 55 minutes? It would be 55 minutes for a thawed turkey. Maybe Chef Rambo should go back to culinary school. You take a star away for your stupidity! I take 10 stars away from you. What a moron. Seriously? You’re being so mean. The recipe clearly says to use a frozen turkey breast. How about read the article/recipe. If you’re using a thawed turkey breast, your timing should be less. (That is plainly stated in the reading, above). This is a pressure cooker recipe, are you aware of that, Georgia? Pressure cooking takes a fraction of the cook time. I think you should stop being so rude and condescending. I had a frozen 3lb Butterball Turkey Breast Roast and was looking for a pressure cooker recipe. When I found this recipe, I got excited because I have an Instant Pot pressure cooker and figured that the timings would be spot on (other recipes on the web set the time to 60 minutes, but they weren’t using an Instant Pot). Unfortunately, although I followed the recipe exactly as written, the turkey breast wasn’t even close to 170 degrees after the suggested 45 minute cook time & the 20 minute cool down. I had to cook the turkey an additional 15 minutes with a 10 minute cool down (and no, I’m not at a higher altitude). . Although the turkey breast roast turned out great, I’m deducting a star for the longer cook time. I made this over the weekend. I am an instapot newbie, so this was one of the firsts for me. it was PERFECT,I cooked it for 55 with a 20 minute warm time.. so delicious and moist. I wanted more so I could have more leftovers. I was confused on the gravy instructions though..the butterball came with a liquid gravy packet was I supposed to use all three of those(2 dry and the one that came with the roast)? I was confused about this too. What did you do? I am making mine now. I made my first 3lb turkey in the instant pot and it came out ok (I followed someone else’s recipe). It was slightly undone in the center. I made two mistakes–cooked for 50 min w/ quick release. After reading your recipe details, I’m going to do 55 min with natural release. 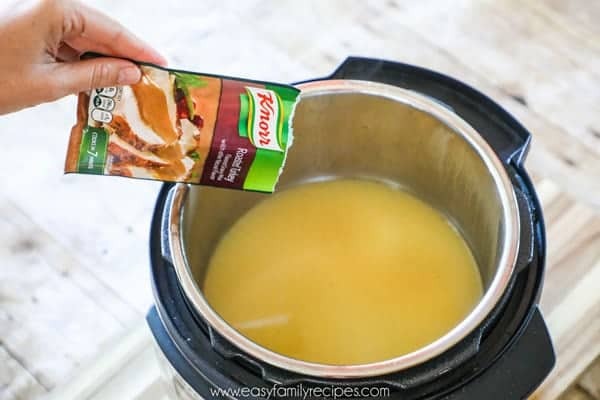 As for the gravy packets, after cooking turkey and straining broth, I put the broth back in the pot to boil for a few minutes–and add the gravy packet the frozen turkey came with a 1 turkey gravy mix packet. Next time I will use an additional turkey gravy mix packet for flavor. I’m not good at cooking, so this was my “trial run” before Thanksgiving. Thanks for sharing! One additional thing I did–after turkey cooked, I put the turkey in a pan with kitchen bouquet on top (browning liquid seasoning), and then cooked it in the oven at 400 for 10 min to give it a crispy, browned look. Just an idea. How big of a pressure cooker do you need for this? I believe mine is a 4 quart. Is that big enough? I have a 6 at but if you can fit it in under the fill line you could use it. I’m not sure how the shape/size compares. Do you think this would work with a turkey breast with stuffing? Any suggestions on cook time adjustment? The recipe was great. I used Mrs. Dash for the poultry seasoning and adjusted the cooking time to 35 minutes for a thawed turkey breast of 5 lbs. The turkey was falling off the bone. Moist and juicy. I used lemon juice instead of lemons wedges. I’ll be using this recipe for all my smaller turkey meals. Thanks for sharing the recipe. I have a 3 Lb turkey breast I want to pressure cook at how many min would you suggest. Its frozen.